"An excellent collection of supernatural Lovecraftian horror can be found in this anthology." This is only Laird Barron's third collection of works, yet his name is widely known and respected. In a short time he has made a name for himself, taking the genre reigns in hand and leading readers on a barbaric and primitive ride through the dark recesses of his imagination. His short stories have been nominated for various awards including the Crawford, International Horror Guild, Shirley Jackson, Theodore Sturgeon, and World Fantasy. His supernatural horror stories bridge the gap between noir, espionage and science. He writes with confidence and aplomb and a delicate but sharp-edged prose that stays with you, making you think and bringing with it a barrage of sometimes frightening imagery. Barron has a way of bringing a distinct, but sometimes ephemeral, Lovecraftian element to a story, bringing his own take on the mythos. The stories are rich, sometimes gothic, contain depth and meaning, and I found myself rereading my favorites to savor the prose and images they create. I revel in the terror, and Barron's brand is one to read slowly, relishing each word. "Blackwoods Baby", "The Men from Porlock", and "Hand of Glory" reached the top of the bunch. His hauntingly gorgeous prose compliments the horror beautifully. He employs a slow build that artfully grows tension and terror, effectively snagging the reader in his snares. His fiction is dark and unflinching, and I highly recommend you check out THE BEAUTIFUL THING THAT AWAITS US ALL, or one of his earlier collections, to discover this talented new writer if you haven't already. Over the course of two award-winning collections and a critically acclaimed novel, The Croning, Laird Barron has arisen as one of the strongest and most original literary voices in modern horror and the dark fantastic. Melding supernatural horror with hardboiled noir, espionage, and a scientific backbone, Barron�s stories have garnered critical acclaim and have been reprinted in numerous year�s best anthologies and nominated for multiple awards, including the Crawford, International Horror Guild, Shirley Jackson, Theodore Sturgeon, and World Fantasy awards. 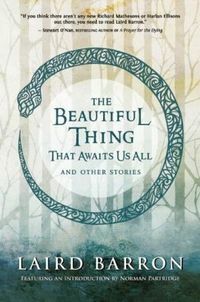 Barron returns with his third collection, The Beautiful Thing That Awaits Us All. Collecting interlinking tales of sublime cosmic horror, including �Blackwood�s Baby,� �The Carrion Gods in Their Heaven,� and �The Men from Porlock,� The Beautiful Thing That Awaits Us All delivers enough spine-chilling horror to satisfy even the most jaded reader.